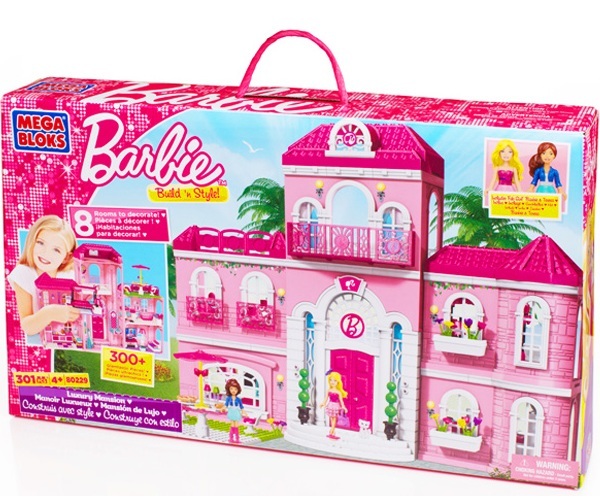 Product Detail Summary: Now you can build, design and decorate your very own dream house with the Mega Bloks Barbie® Build ‘n Style Luxury Mansion. This beautiful home includes eight interchangeable rooms that can be built any way you want! Build a bedroom with a beautiful canopy bed, a fun living room where your Barbie® and friends can relax or a bathroom with a “bubbly” tub! – It’s totally up to you! Take the working elevator all the way to the top floor for a super fun party with Fab Girl™ Barbie®, Teresa® and all their friends!